Hey Pastor? Those snakes bite. That is a verse in the Bible. It’s meant to be a metaphor highlighting the power of the Cross in a Christ-follower’s life. It wasn’t said for fools to walk out in the desert, see a cobra, grab it by the tail and start dancing like a freak. Nonetheless, that happens, which is what gave this guy a reality show on the National Geographic Channel. And today, he’s dead. Surprised? It’s been a “tradition” for some non-orthodox sects in Christianity, which is why NatGeo was so fascinated when they met Pastor Jamie Coots. To this guy, it’s more than confusing a scripture to believe his blood would be the antidote against a snake’s venom. He actually believed that if he didn’t do what he did, he would be destined for hell. 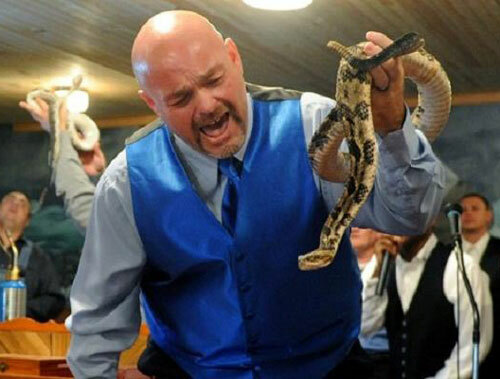 So, how do you think the Kentucky minister feels now that he’s dead because of his 12th snake bite? Hell bound? Ashamed to walk in the Pearly Gates? His son, Cody Coots, who is also a snake handler in church, told a local newspaper that the snake that gave his father the fatal bite was a 2-and-a-half-foot timber rattler. Ya’ think he will learn? Lord, have mercy.